Professional asphalt sealant will beatify and significantly enhance as well as extend the life of all asphalt driveways. Avoid costly asphalt repairs or a complete resurfacing job by taking advantage of our professional asphalt sealing process. East Coast Paving, specializes in residential & commercial asphalt sealing, maintenance and repairs. A quality sealcoat application requires that the driveway surface be properly prepared to receive the sealant. The use of a quality crack filler, cleaning, power blowing and the use of the right application tools are important and necessary for bonding and adhesion to take effect for protection that lasts. Professional sealing is practical and economical protection. Especially when compared to the alternative: completely replacing a damaged driveway. Asphalt sealant enhances the appearance of your driveway and adds to the overall appeal of your property, especially if you are planning on selling your home. We use only quality contractor grade sealant and never use retail grade sealant on any project. Industrial grade will last much longer and provide a durability not normally available at retail stores. Oil and gasoline spills can ruin asphalt driveways. Proper sealing will help to provide a degree of protection and preserve the driveway from excessive deterioration due to these spills. 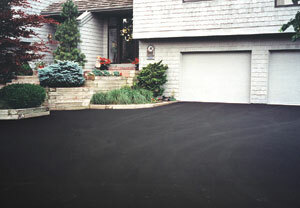 Sealing protects the surface and fill void, reducing exposure to oxygen and water, prolonging the life of your driveway. The sun's rays break down the link between carbons in asphalt, causing the pavement to crumble. Regular sealing prevents UV Rays from penetrating your asphalt.